During the whole of 2011 there were a mere 12 work stoppages and they involved barely 2,000 workers and only 4,850 person-days lost (to exploitation); so says the Department of Labour. Even worse, only 9 of the 12 stoppages were actual stoppages. The other 3 were what the DOL calls ‘partial strikes’, which are not strikes at all but actions short of a strike, such as go-slows and overtime bans. These statistics started with 1986 when there were over 200 stoppages. Since then the strikes trend has been steadily downwards. 2010 had 18 stoppages, but 2011 surpassed that record low. Had the working class lost all fighting capacity? Could things get any worse? We now know the awnser to these questions and that a corner has been turned; 2011 will be the nadir. 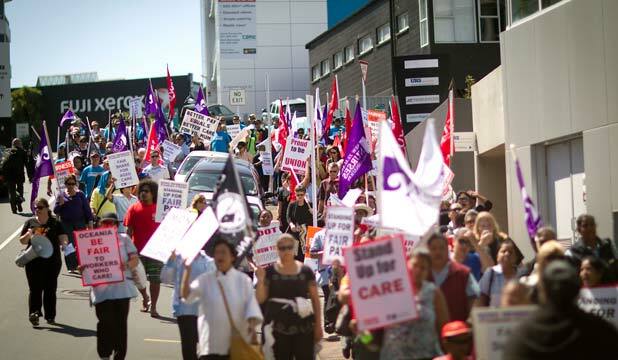 By comparison, the first months of this year saw a veritable explosion of strike actions, involving 1,500 aged care workers, 1,300 meat workers and 300 wharf workers. It was in the nature of the times that these struggles were defensive; against attacks by the employers. The outcomes are heartening. The aged care dispute was settled in June with a 3.22 pay rise and preservation of overtime rates and other rights that were under threat. The meat workers saw off an attack on the union and won a contract. The Maritime Union humbled the Ports of Auckland Ltd to defend direct employment and conditions. When pushed too far workers have demonstrated resilience and tenacity to resist attacks. There can be no doubt that the employers nationally have taken note, and that what threatened to be a general management onslaught on working conditions has been diffused to some degree. However, the class struggle waged by the capitalists goes on. KiwiRail’s Hillside Workshops were put up for sale in May and may be sold by the time this article is read. Solid Energy is prettying itself up for privatisation by sacking miners. The cutbacks taking place across the public sector are relentless. A lot of the attacks on jobs and services are hard to organise resistance around, particularly piecemeal attacks that do not bind a lot of people together in the same boat at the same time. Contrast with when the government launched a frontal attack with their plan to cut teacher numbers nationwide. Hekia Parata sparked such a reaction in the educational establishment that she had to back down. Continuing out theme of strike trends, the last four months have been ones of a reversion to quietude. The question of eroding living standards is a slow burning fuse. It is impossible to predict when the overdue workers’ pay revolt will occur, only that it will. Hard times, unemployment, put workers on the back foot. History teaches that a pick up in the economy often brings about a recovery of workers’ confidence and strikes. The New Zealand economy is in a bad way, but the government doesn’t admit it and the nation’s complacent news media scarcely reports on it. Gross Domestic Product for the year to March was up 1.7% on the year to March 2011, but this is a pretty low figure for a recovery from the 2008-2010 recession. The weak performance has not been enough to boost employment. Basically, the unemployment rate has not changed since the worst of the recession. Unemployment actually increased by 4.3% over the year to June. At the last count there were 162,000 unemployed, an unemployment rate of 6.8%. These figures would be much higher but for the exodus of workers to Australia. There were a record 53,900 departures to Australia in the year to July, more than offsetting total immigration. The comparatively buoyant Australian economy is acting as a safety valve. It provides New Zealanders with an individual solution, rather than to stand and fight collectively. Part of the problem is on the political side. The Labour Party, and the trade union bureaucracy drawn behind it (whether formally affiliated or not), is proving unable to inspire visions that society under a Labour government would be any better. This is hardly surprising as Labour under David Shearer is sailing so close to National’s politics that the difference is hard to detect. Labour will not even commit to reversing National’s privatisations and spending cuts. Workers are not getting any call to arms from this quarter. In summary, the state of the class struggle today is one characterised by a continuing lack of confidence by workers to take collective action. The lack of confidence continues from the political and economic setbacks from the mid-1980’s onwards, and is currently held low by economic conditions. But (an important but), the strikes of earlier this year demonstrate that when pushed too far workers will fight back. The employers and the government continue to tread wearily lest they provoke a reaction.